SJVN Ltd Recruitment 2018:- SJVN (Satluj Jal Vidyut Nigam) Limited, Himachal Pradesh has passed notification for Graduate, Technician (Diploma) and Technician (ITI) Apprentices posts. Total available vacancies are 230. Interested candidates can apply online from 04-Dec-2018 to 29-12-2018. Selection by SJVN Ltd will be based on the marks obtained in Matriculation/ ITI/ Diploma Examination. 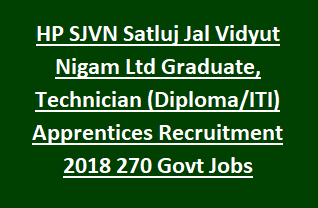 Other details like Selection criteria, Age Limits, Stipend, Vacancy details for SJVN (Satluj Jal Vidyut Nigam) Limited Recruitment are given below. Online registration starting date: 04-12-2018. Last date for Online Application registration: 29-12-2018. Total Available vacancies in SJVN Ltd Recruitment are 230. Technician (Diploma) Apprentices: 50 posts. Technician (ITI) Apprentices: 80 posts. For Graduate and Technician (Diploma) Apprentices posts: Candidate possess full time Degree/ Diploma in Engineering/ Technology in relevant branch from AICTE recognized University or Institute. For Technician (ITI) Apprentices posts: Minimum 10th pass and 2 years ITI course in relevant branch. Candidate minimum age limit is 18 years and maximum age limit will be 30 years. Age Relaxation for SC/ ST is 5 years; 3 years for OBC Category candidates and 10 years for PWDs. ITI Apprentices: Rs.5, 000 /-. Candidate should pay Application fee of Rs.100/- . For ST, SC, PWDs Application fee is Nil. Candidate selection will be based on marks obtained in Matriculation Examination/ ITI/ Diploma. Eligible candidates apply online through SJVN’s Website www.sjvn.nic.in. After filling the application form take print out and send it along with Demand Draft to the given address. Last date to submit online application is 28-12-2018. Pradesh. Official Notification for Himachal Pradesh SJVN Engineering Graduate/Diploma/ITI Apprenticeship Training.. Apply Online here for SJVN Ltd Apprenticeship Program.